Rep. Adkins and McCracken Dem Chair Jennifer Smith at forum April 1st. 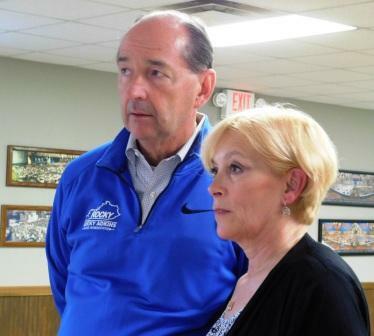 Rep. Rocky Adkins was back in Paducah on Monday April 1st for a candidates' forum sponsored by the McCracken County Democratic Committee. Of the four Democratic candidates, only Adkins and Geoffrey Young were present. Candidates Andy Beshear and Adam Edelen weren't there. Committee Chair Jennifer Smith said that more events will be scheduled when, hopefully, the other candidates can be present before the May 21st primary. Representative Adkins has been in the Kentucky House since 1987. He came to the House in his twenties and has been on most committees. He was majority leader until the Democrats lost the House in 2016. He now serves as minority leader. In his remarks to the fifty plus attending the event in Laborer's Hall, Adkins pitch was that he has the "experience and proven leadership" to defeat Matt Bevin. He vowed to bring "common sense" back to Kentucky government. Adkins said that Bevin and the Republicans created charter schools which will siphon funds from public schools. Adkins, a Morehead State graduate and college basketball player for them touted his work with the Speed Engineering School, Morehead's science center and communication technology centers. He does not agree with the privatization of public pensions. Adkins said that the comprehensive reforms of 2013 were designed to fully fund pensions. Rep. Adkins is a cancer survivor. He criticized the Governor's plan to cut Medicaid which is predicted to take 100,000 Kentuckians off health care rolls. When asked what his first priority, in legislative speak his House Bill 1, would be, Adkins said that free community college and technical education. Not just for high school graduates but for displaced workers and those seeking a better career. Adkins stressed that free means no tuition. There will be strings. Students will have to maintain an acceptable grade point average and commit to stay and work in Kentucky for at least two years. Adkins believes that a highly trained, highly skilled workforce will attract business to Kentucky and slow the out migration of young people from the Commonwealth. Because a new poll had Kentucky at the 8th worst state for adult obesity, we asked the former basketball player what he would do to address the problem. Adkins said "Public awareness is key" to help adults with obesity. Young people need more physical education. Everyone needs better access to healthy foods. Considering the most recently adjourned General Assembly with a super majority of Republicans in Senate and House, Adkins was asked if he was saw anything positive from the Republicans. He said that he believed there was "more communication from leadership". Rep. Adkins, a member of the Pro-Life Caucus and the Mountain Caucus, describes himself as a "moderate". 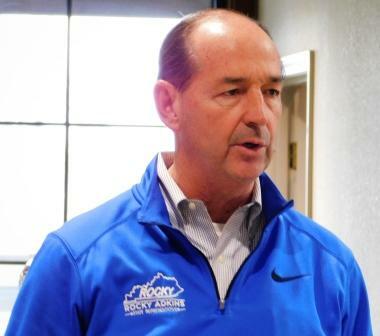 As the moderate (or least progressive) Rocky Adkins will be working to convince Kentucky Democrats who vote in May that his experience, his ideas and his philosophy are the right combination to beat Matt Bevin in November.